I'm madly stitching away, trying to catch myself up! 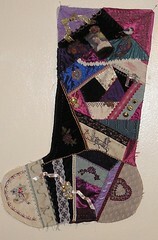 This is a picture of the work I did on a friends stocking. It is about 3 feet long so it had losts of opportunity to spread out! I enjoyed working on this and hope that Shari is happy with my work! 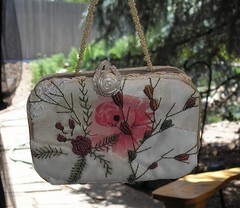 I'm wayyyyyy late blogging about this purse. 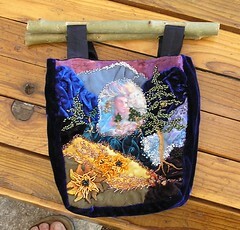 Im still trying to get myself caught up I guess after the Making Memories quilts. 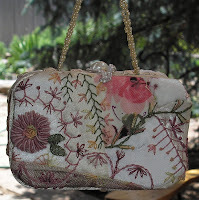 Anywhoo, I made a purse for the CQI (Crazy Quilting International). I'm happy to at least have finished it as its been over two years in the making! LOL! This was also a lesson in UFO's and the "brilliant" ideas that we may have had at conception. If ya don't write it down..... wellllllllllllllllllllllll, ya probably et the idea! LOL! 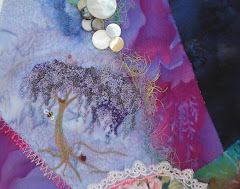 So, as I didn't remember the "where" I was going, I added a Josephine Wall silky and then embroidered and beaded a couple of trees, etc. If you click on this pic, it ought to take you to my Flickr album which will let you see the other side, etc. As I said.....i'm a winner cuz I finished the project! (Wink) I didn't win or place in the contest...which is just fine! I STILL finished a project! VBG! Enjoy! 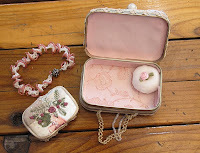 I have finally finished my tin for the swap that we are holding at CQI. 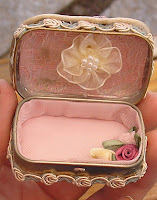 This is an altoid size tin. I first spray painted the edges, cq'd the sides, added the lining, beaded handle and "catch" and then made a little pin cushion for the inside along with a mini tin for needles. As a special gifty I made a bracelet I hope she will enjoy!